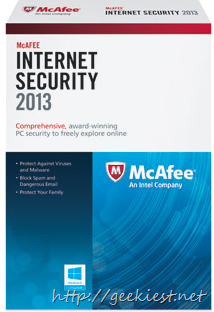 McAfee Internet Security 2013 is one of the best Internet Security Suites available. And if you are looking for a Free full version license, here is one you can get. If you want to get a free full version license of Free McAfee Internet Security 2013. You will need to have a credit card (you will not be charged). Make sure you cancel the auto renew option after logging in. Grab a FREE 6 Months Extended trial version of McAfee Internet Security 2015 and stay protected. Get Avast Internet Security 2017 for 1 year for free from Computerbild.